If you’ve heard of the Original Stretch Armstrong then get ready to meet his arch enemies, Stretch Vac Man and Stretch XRay from Character Toys. These also come in smaller 7 inch sizes which actually makes them more child friendly in terms of holding, carrying and stretching them. The figures are both very soft and stretchy and you can literally stretch them in any way you want to. They simply just pop back to their original shape when you let them go. Vac Man has a unique quality in that he has a valve on the top of his head that you can pump up and down to remove all of the air out of him, leaving him with a lumpy texture that is poseable and stays that way until you press the valve to fill him up with air again. He can be stretched either whilst pumped up or pumped down so there are multiple ways to try playing with the Vac Man. My children found XRay Man to be exceptionally squidgy and stretchy and loved pulling him apart to get a closer glimpse of his insides. It is even possible to tie his legs up although I had to be quick with the photos because he soon reverts to his normal self. My kids found the new 7 inch Stretch characters great fun and it gave them a laugh as well as entertaining them for a while. They are easy to carry around and I often find them sitting on the sofa giving one of the figures a stretch or working together to see how far they can stretch a set of arms or legs. If you are looking for a toy that provides a bit of fun and entertainment then do check out the Stretch characters and don’t forget to follow along on the Stretch Armstrong PopJam channel or on Facebook, Twitter & Instagram. 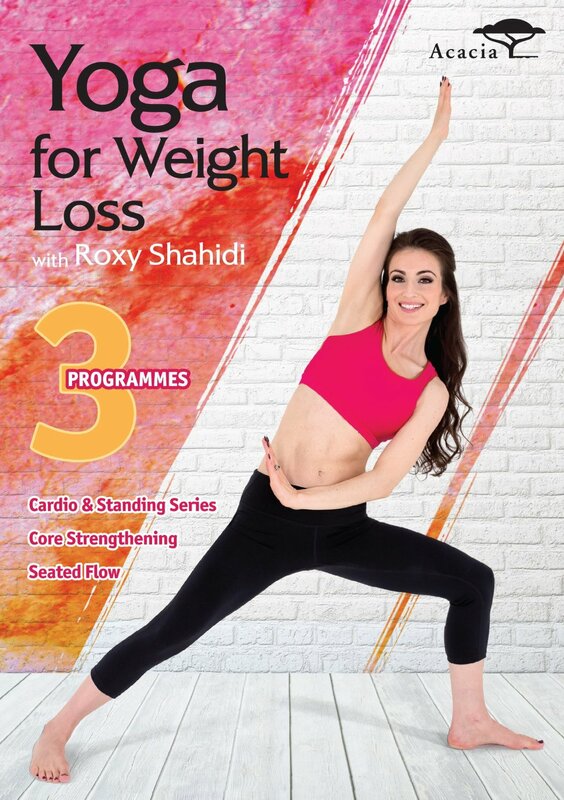 Yoga for Weightloss with Roxy Shahidi DVD is perfect for working out to at home. With not much spare time and little time to get away from the children to reach a gym, this dvd is something I can do in my own time, as and when I get an opportunity. The DVD is broken down into sections and consists of a warm up along with three different programmes and some winding down stretches at the end. WARM UP: (10 mins) This fluid warm up is designed to gently wake up the body and get your energy system flowing so you may start your practice feeling invigorated and awake. SEQUENCE 1: Cardio & Standing Series (20 mins) This flowing sequence consists of the classical sun salutations all constructed to raise your heart beat and build strength. As we build heat in the body we begin to detoxify and purify ourselves allowing us to work off that extra weight and tone up our muscles. SEQUENCE 2: Core strengthening (20 mins) This core sequence focuses on the mid-section of the body with focus on your abs and lower back. We all tend to store most of our extra weight in this area so this firming sequence is targeted to build up your muscles to provide you with a solid core. The lower back movements help improve your posture to prevent slumping, as good posture promotes correct organ function and aids in elimination of excess calories. SEQUENCE 3: Seated Flow (20 mins) This gentle flow is designed to help you unwind and relax. Stress is one of the main causes for over-eating or over-indulging but there are better ways to calm you and release tension. Stretching the body will help you let go of any mental, physical and emotional blockages that are keeping you from being the best you can be. BREATH: (10 mins) The breath is the quickest way to invigorate and open the body. This breathing practice can be done anywhere and has been formulated to energise you to start your day or re-charge yourself periodically when you need a lift. SAVASANA: (5 mins) The savasana is a full relaxation practice to help you let go and completely unwind and put you in a meditative state. We all need to rest and this time allows all the work you have done in the previous flows to integrate into your system allowing change to take place. Roxy uses these practices to keep her in shape and looking and feeling her best! So come join Roxy in this yoga practice to rev up your metabolism and firm your core so you can look and feel great! I found Roxy Shahidi very easy to watch and follow. The DVD was very clear and she guides you with ease through the workout. Yoga is normally thought of to be relaxing, rather than for weightloss, but this DVD really does get you moving, in particular I loved the stretching and how flexible it’s making me feel. Although I know I should be exercising more than I do, I would rather do something like this than a fast paced cardio workout that I wouldn’t stick to and keep doing. Knowing this yoga routine is gentle yet effective, I try to fit it in a couple of times a week and I’m certainly feeling better for it. All reviews are my own and my family’s opinions and we received the dvd in order to write the review.